The work is getting done. Guess who's in charge. He has been at the same organization for over thirty years. He knows the business inside and out. Wrote most of its policies. And conceived and implemented nearly every one of its processes. But in his organization, a new wave of up-and-comers are . . . up and coming. They’ve not changed any of the policies. Yet. But they are beginning to tinker with the procedures. Don’t get me wrong. That’s fine. There are always new and improved ways to do things. I have no problem with that. What I do have a problem with is the way they regard my Husby. Suddenly this man who has been a main cog in the great machine is being regarded as a bit rusty. The fact that he has personally schooled and guided every single one of these young people means nothing once they’ve gotten their momentum. And they’ve definitely gotten their momentum. Our story is not unique. I see it happening all around me. Older people who were once at the forefront of their fields of expertise are being sidelined. Disregarded. Those who, though they may have fallen a bit behind in the technological side, could still be viewed (and utilized) as a source of wisdom and knowledge. Husby and I were speaking of it this morning. The lack of . . . respect. Is it something the new generation has not been taught? All of this is my long-winded way of telling a story. Which I’m ready to begin. Finally . . .
During its heyday, the Stringam ranch was a hub of activity and a great source of employment. Cowhands came and went. Learned a little or a lot. But left better than when they had ridden in. And a large part of that was due to my Dad’s example. He led, choosing to work with the men rather than give orders and watch from the sidelines. He counselled. Disciplined. Instructed. Corrected. Instructed again. And the men respectfully listened. Oh, there was the occasional man who didn’t like the discipline that the Stringam ranch demanded. But even they learned to show respect during their short stay. Most of those men went on to lives of industry. Some to direct their own enterprises. All speak of my Dad with respect and affection. One man had come to my parents fresh out of high school and had then stayed a number of years under the tutelage of my Dad. In his quiet way, he soaked up everything he could learn. Then he married and finally left to begin his own ranching enterprise. The bond of friendship has remained strong. A few weeks ago, he called my Dad at Dad’s room in the local senior’s lodge. 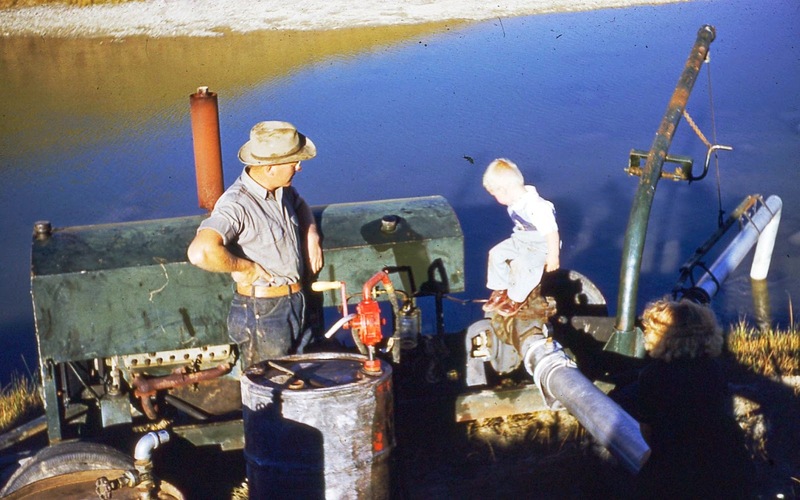 The man, and his son who was now running their family ranch, had a difficulty and needed some advice. Who did they turn to? My dad is nearly ninety. His days of directing the affairs of a large ranch, riding the range and commanding crews of hired men are long behind him. But the respect for his knowledge and expertise and the genuine affection go on. Is this being taught today? Do we look at the elderly people around us (and they are growing in number) and see someone who is merely old? Redundant? Stupid? Or do we see the person that they were. A person full of life and new ideas. Contender and driving force and world changer of their generation. A person who could still be a fund of knowledge and experience. A person upon whose shoulders the newest generation is standing. If not, it’s a great waste. P.S. About the picture. 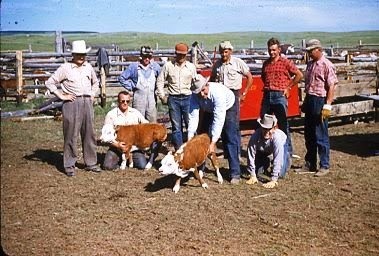 The guy in charge is the one kneeling on the ground, holding the calf. Branding time was an opportunity to celebrate. The calf crop – the ranch’s major source of income - had mostly passed the first difficult months and was growing well. The warm, summer months had arrived. One got the chance to spend a day or two in company with one’s friends and peers. For the mostly solitary riders, a rare treat. On many ranches, it was a time to kick up one’s heels. Now the Stringam Ranch, where I was raised, was a liquor-free zone. But on many ranches, the alcohol was flowing even before the last animal was branded. Who doesn’t see any sources of concern here? One particular tale of woe, told to us by our dad, stayed with me forever. The branding was nearly finished for the day. One of the hands had produced a bottle of something code-named ‘Hair of the Dog’. It was . . . strong. And its effects pretty much instantaneous. Said bottle made a couple of rounds. By the end of the second pass, the boys were (to quote something ‘ranch-y’) feeling their oats. The rest of the afternoon passed in a literal blur. The last animal was branded. Who, what or where, by this point no one really knew. 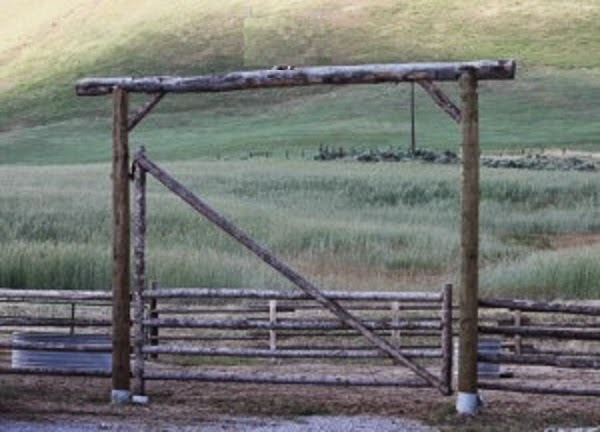 The corral gate was swung open. I should probably mention that these cows and calves had been cooped up all day. They were hungry, tired, stressed and sore. The great outdoors looked just like that. Great. En masse, they poured through that opening, heedless of anything that may be in the way. The boss of the outfit suddenly remembered, through a slight haze, that there had been a cow noticed earlier. A cow with a horn that had curved the wrong way and was now threatening to actually grow into the animal’s head. Easily fixed with a couple of lassos and a small saw. But now that cow, along with her fellows, was making her way as quickly as possible toward the G.O. (see above). He leaped aboard his trusty steed (which immediately proved itself to be anything but trusty) and gave it the spurs. The animal, lacking somewhat in dignified communicative skills, resorted to the less dignified. Now, normally, this would have resulted in a few strong words with maybe a dusting in the prairie soil. But in this particular instance, location was everything. Because the animal chose to express itself under the crossbar of the corral gate. That first leap mortally injured the rancher. Now the man had lived a rough life. Worked rough. Played rough. And drank rough. But no one deserves a rough death. I don’t know what the effect was on those boys who witnessed the event. But for me, even listening to it third-hand made me vow never to mix alcohol and any form of ranch work. I know most of you won’t be toting a branding iron any time soon. So, just FYI . . .
Leave the liquor in the bunkhouse. Labels: When ranch work isn't fun. Mom lied to her kids. Okay, yes, she had a good reason. And no, it didn’t turn out well. On the Stringam ranch, the ranch house and buildings were nestled snugly in the bend of the south fork of the Milk River. A river that, at certain times of the year, turned into a rushing, deadly torrent. A river to which my older sister was drawn like a baby to an IPhone. After several hair-raising episodes in which my mom, my sister and wet, cold, muddy, slightly deadly and totally unsympathetic river water featured strongly, Mom decided to get more pro-active. What better way to police than to make the kids want to police themselves?! And by the way, this is where the lying comes into play . . . Using her not unspectacular story-telling abilities, Mom described the octopus that lived in the milky waters of the great Milk River and waited patiently for little kids – its favourite snack – to show up by themselves on the river bank. Little kids that, without parental accompaniment, were fair game. 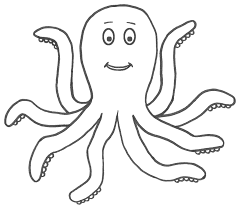 The octopus would then be able to seize and drag them down to the ‘depths’. Her dramatic portrayal lost nothing in the telling and she soon had my sister shivering with fear. Or what Mom mistakenly thought was fear. The next day, Mom, happily secure in the fact that her daughter would never, ever again go near the octopus-infested waters of the Milk River, turned her back for a moment. Only to discover that her daughter had, once again, disappeared. And taken her 18 month-old brother with her. Mom sprinted, out of habit, to the river. And there she found her two little ones. Happily clambering about the slippery slopes, looking into the dark water for a glimpse of the octopus that lived there. I think we all learn a lesson from this. Don’t waste your most lurid story-telling skills on a child with more imagination than you. Now picture it with a frown. Labels: Not to be taken lightly. 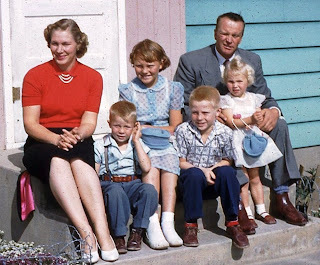 My Mom had eight brothers. And each of them had a sister. Most of the time, this was a good thing. And when someone put a banana peel down Mom's back at school, the boys 'protected' her. It was a good balance. Being the only other female on the farm meant work, however. Besides helping with things outdoors, she had indoor chores. Those 'invisible' things that go unnoticed until they don't get done. Of all of them, the most entertaining was always the laundry. You never knew what you would find . . . There was one very firm rule in the Berg household. You cleaned your plate at mealtime. 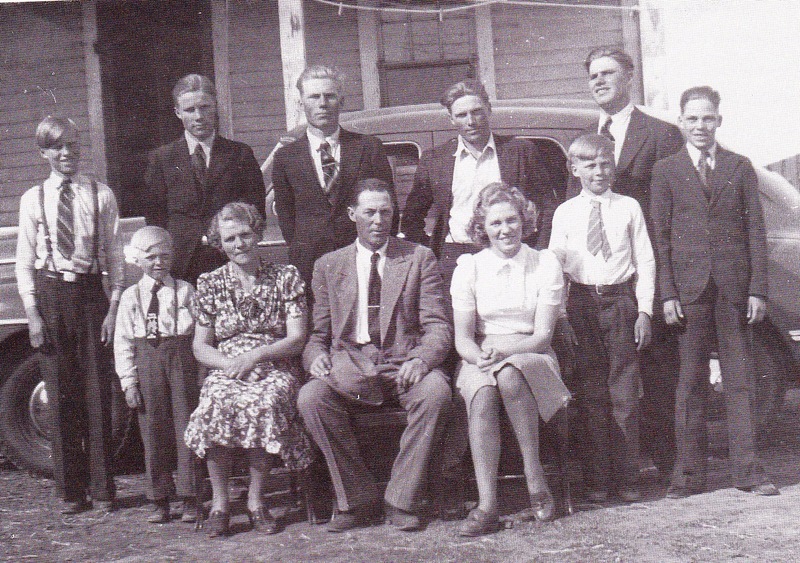 Much of the food was produced on the farm and Grandpa Berg took a very dim view of any of it being wasted. Each of the sons, and the daughter, had to show an empty plate before they were allowed to leave. If they had been served something they didn't like, they had to eat it anyways. Uncle Leif, the youngest of the brothers, took the second option. He knew that those vegetables and potatoes he had been staring at had to go somewhere. No dog or pet was allowed inside the house, so one couldn't slip food to them under the table and his parents would notice any significant quantity of food simply thrown on the floor. His options were definitely limited. But he would think of something . . . When Mom and Grandma Berg were doing the laundry, it was Mom's responsibility to turn out the pockets on the boy's trousers. Inevitably, it was an entertaining enterprise. Especially when they got to Uncle Leif's. Because that was when they discovered what had been done with those unwanted and totally unnecessary vegetables and potatoes and that while he had been sitting there, contemplating, he had come up with the most ingenious and inventive method of making them disappear.He was wearing trousers. And they had . . . pockets. Back in the laundry, Mom turned out each pocket to discover little, dried up memories of yesterday's dinner. And, as I said, entertaining. And that was just the laundry. Imagine what he could do with such things as chores. Labels: What did you think pockets were for? Daddy and Me. And George. I'm the one with the curlers in her hair . . . If I had to state a preference, I would have to admit that I favour big, hairy ones. But, truth to tell, I like all kinds. Pointy. Fuzzy. Smooth. Dreadlocked. Naked. Huge. Tiny. Rat-sized. Medium. Purebred. Heinz 57. If it resembles a dog in any way, I’m well on the way to being smitten. And I’ve always been this way. In the past, if any member of the ‘doggy’ fraternity crossed my path, I was ready to welcome it with open arms. And therein lies a tale . . . I was playing with my friends on the school playground. I’m not sure what we were playing, probably something noisy. A dog wandered into our sphere. A black and tan dog. Thin and wasted, with the worst case of ‘post nasal drip’ I had ever seen. But with long, silky hair and beautiful, but sad, teary brown eyes. And, my dad was a vet. He could fix my new best friend! I clutched a handful of hair, just behind the dog’s head, and led him to my house, two blocks away. The rest of the kids followed. We were an ‘in the moment’ crowd. What can I say . . .? It took a long time, with frequent stops for my new friend to rest, but finally, we arrived. My Dad met my dog and me as we came up the drive, followed by the rest of the neighbourhood. Dad was used to me. If I detected a trace of hesitancy, that’s probably because he had learned to view anything I did with . . . hesitancy. Dad glanced at the dog. Then he looked at me. I put on my most endearing face. At least, that’s what I was going for. He looked the dog over. “I’m afraid he’s really sick, Honey,” he said. I turned and grinned at the other kids. See? My Dad could do anything. I looked at the dog. It wagged its tail slightly. See? It was better already. He helped me lay out a blanket and settle my doggie on it comfortably. Then he closed the garage door and told us to let him rest. I peeked in through the garage window a couple of times. It was easy enough if I dangled from the clothesline just outside. But my little friend just lay there on the blanket. The next morning, I leaped out of bed and charged down the hallway, on my way to see my new friend. My Dad met me at the door. I was sad, but I knew that Dad had injected him with just the magic elixir (yes, we used that in the 50’s) that would heal him entirely. And thoughts of my doggy running and playing with his family cheered me. There is an addendum . . . I was visiting with my Dad and he recalled the story of my little short-term friend. I hadn’t thought about that little dog for over fifty years, but suddenly, I could picture the soft, brown eyes. The long, silky hair and funny, tan ‘eyebrows’. The skinny body. I felt unaccountably sad for the little fellow. But, just as suddenly, I was grateful to my Dad. For his skill. For his compassion. He did manage to fix him after all. Labels: Dad's can do anything. Mom, George, Chris, Jerry, Dad and me. My climbing ability was legendary. My experiences, many and varied. Many's the time my mom would sprint up the old machinery hill to save her tiny daughter from the jaws of certain death. Or at least from a very unpleasant fall to the bottom of the 100 foot TV tower. 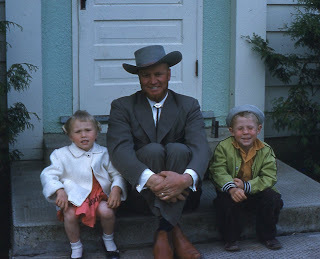 My father, too, was no stranger to my favorite activity. During a visit with the manager of the Prince of Wales Hotel in Waterton, Alberta, the new chandelier in the great room was being discussed. "It's magnificent," Dad said, gazing up into the rafters 50 feet above them. "Yeah, we really like it," the manager said, following his gaze. "The only thing I'm concerned about is how we're going to clean it." "Clean it?!" Dad said. "Well, I have a daughter who will climb it!" 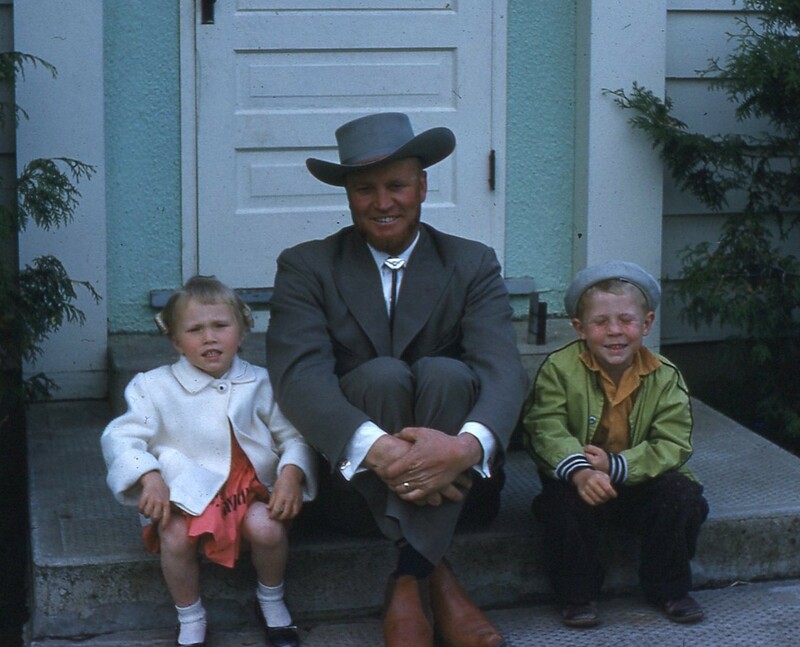 Together, my parents plucked me off the top of horses, bulls, pigs, haystacks, combines, tractors, trees, fences, shed roofs, barn roofs, garage roofs, car roofs, water towers, windmills, and even the occasional propane tank. Admittedly, a fall from many of them probably wouldn't have been fatal. Just . . . uncomfortable. But no amount of lecturing or lurid stories illustrating the dangers of such activities could discourage me. I just had to climb. And then that fateful day . . . Isn't it odd that fateful days never, ever seem to start out any different from any other day? I mean, sullen, red skies would be entirely appropriate. With phenomena. That way, you'd know that something momentous was about to happen. I had discovered a wonderful new activity. It included Mom's clothesline and the picnic table. For some reason, the table had been shoved close to the clothesline. Close enough that someone daring - me - could make a run along the table and launch oneself - also me - onto the clothesline. Now I should point out here that Mom's clothesline wasn't one of those boring long stretches of wire so useless to an enterprising youngster. No. It was a new-fangled round one. And if you leapt and caught the wires just right, you could spin all the way around and back to the table. Several times. In fact, I was the neighborhood champion. Again and again I would perform for my audience to appreciative oohs and aahs. Several of the kids tried it, but no one could go quite as far or as fast as I could, although some were getting close. I decided it was time to up the ante. I was going to try for a double axel. It had never been done. Never even been attempted. But I was going to do it. I dusted my hands together and poised at the back edge of the picnic table. I took a deep breath and launched myself along the table. I flew gracefully across the intervening space. Even more perfect.I reached out for the wires. And for the first time in my life, missed. I reached again, frantically, then looked up at the wires, as they slowly moved further and further from me. With a heavy thump, I hit the ground, driving every square millimeter of air from my lungs. My friends stared at me, frozen. Then there was a collective scream and they all rushed forward. "Diane! Diane! Are you all right?" I just stared at them and tried to catch my breath. Then a horrified, "Diane, you're bleeding!" I looked down. They were right. Blood was spattered on my shirt and shorts. I looked at my arms. My legs. Then I tried to talk. And realized where the blood was coming from. Shocked, I put a hand over it. My Mom came on the run. "Oh, my!" She knelt beside me and put a towel to my chin. "Open your mouth, Honey." I tried to obey, but my mouth didn't want to. It had suddenly begun to hurt. It wanted to stay shut. I felt the tears begin. "It's okay, Honey, just open your mouth." Finally, I was able to open it. A little. Mom gasped, and put the towel over my mouth. "Come on, Dear, let's get you into the house." "Mrs. Strin-gam? Will Diane be all right?" I vaguely recognized Laurie's voice. "She'll be fine, Dear. I'll just take her into the house and get her cleaned up." Mom half-led, half-carried me into the cool, quiet house and sat me down on the cupboard in the kitchen. Then she sponged the blood off my face and neck. "Let me have another look, Honey," she said. Obligingly, though I really didn't want to, I opened my mouth for her. "Okay, well, you've cut your tongue, Honey. It's probably going to hurt quite a bit. But it'll be all right." So she kept saying. Why didn't I believe her? "Here. Hold this while I call Doctor Clemente." I took the towel she was pressing to my face while she went to the phone. "Yes, Doctor." I could hear her in the hallway. "Yes. Okay." She hung up the phone. Then she was back beside me. "Here, Honey, let me take it." She gently swabbed at my mouth again. Mom could make anything feel better. Later, after I had refused supper, a new thing for me, I overheard her talking to Dad. "Yes, I think it's bitten at least half-way through. It's still attached, but barely. The doctor thinks it will heal just fine, but it'll be a while, and it'll be painful." That is parent code for 'forever'. It did heal. And quite quickly, too, in 'Parent' time. During that time, I was the focus of all of the neighborhood kids. Everyone would come up to me and ask me to stick out my tongue. Then ooh and ah delightedly. It was almost enough to get me climbing again.